Successfully Added Carp Fishing Bite Alarm (LED + Tone Indicator) to your Shopping Cart. If you're into serious fishing like carp fishing, catfish fishing, or even sturgeon fishing then you'll definitely enjoy all the extra big fish you'll catch with the H40 Carp Fishing Bite Alarm Set with LED lights and tone indicators. How does it work? Basically, you run your line through the alarm crevice of the transmitter unit and let it rest against the roller inside. When you get a bite, the line will move, and the roller will turn thereby triggering the alarm to sound. What's included in the alarm set? 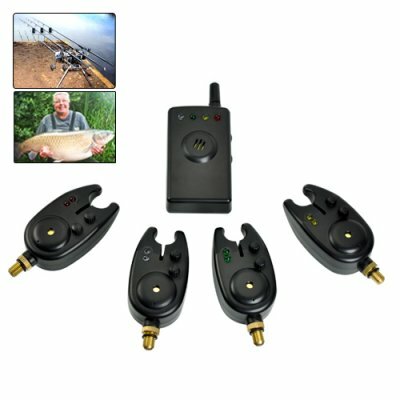 The H40 Carp Fishing Bite Alarm Set with LED lights and tone indicators comes with 4 transmitters which can monitor 4 separate fishing rods and 1 receiver which helps you track the status of all four fishing poles! Day or light, The H40 Carp Fishing Bite Alarm Set with LED lights and tone indicators is your best bet for catching fish without all the boring wait time usually required. In daylight, let the tone notify you when you've caught some fish. At night, use the led light along with the tone to help you stay on top of the fishes! The H40 Carp Fishing Bite Alarm Set with LED lights and tone indicators - The difference between actually catching big fish and making up some story about the big one that got away. Brought to you by the leaders in direct from China wholesale electronics and dropshipping - Chinavasion. Monitor 4 fishing poles at the same time! Monitor your fishing rods from up to 200 meters away! What's a buzzer boy? In sport fishing, if you're in an area with lots of people, it's bad etiquette to have your tone alarm go off constantly. It irritates other people. A lot. And they'll call you a buzzer boy! In such a situation, turn down the tone alarm volume and rely on the flashing LED lights to help you identify whether fish are biting.